Army ranks with parents and the triplets and some gifts yesterday. 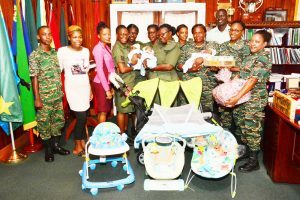 The triplets born to Guyana Defence Force soldier, Lance Corporal Delroy George, and his reputed wife, Mandisa McKinnon, yesterday received some ‘Army love’ during their visit to Defence Headquarters, Base Camp Ayanganna. The infant boys, Demitri, Dekkeri and De Juan, and their parents were guests of Chief of Staff, Brigadier Patrick West, who congratulated the couple, while members of the Women’s Army Corps presented them with several gifts of baby supplies. It is the first time that a soldier has become a parent to triplets, the Army said. “We will hold them close to our heart and all we demand of you is that you be good parents to them. 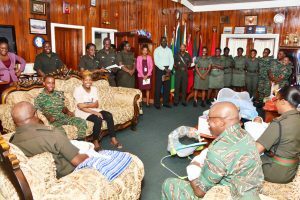 The Guyana Defence Force is happy that you have this blessing and we look forward to seeing them grow and one day, collecting bursaries and academic awards,” he said. Lance Corporal George has also been granted additional leave to provide the necessary paternal support. He is currently a caterer at Training Corps, stationed at the Colonel Ulric Pilgrim Officer Cadet School, Tacama. Following the completion of his leave, the Chief of Staff revealed that the soldier will be posted to Base Camp Ayanganna, which permits easier access to family. Brigadier West said that with the assistance of Minister within the Ministry of Communities, Valerie Adams-Patterson, the couple has acquired a plot of land and will be the owners of their new home, which the Force will assist them to build. The couple was reassured by Brigadier West that when the triplets are older, they will benefit from free space at the GDF’s Margaret Rose Arthur Day Care Centre. He also committed to providing school uniforms for the children when they start school. Representatives of the Force’s Credit Union were also on hand and presented the couple with a monetary donation and revealed that they have set up Junior Saving Accounts for each of the babies. The babies were born on July 6 at the Georgetown Public Hospital Corporation. Army love: Officials with the family and the babies yesterday.